I've had this game since the early days of my Master System collection, but until recently i've always overlooked it and had never bothered to give it the decent play that all games deserve. Who would have guessed a high score competition would have inspired me to write my first ever review. Quite a random shmup which sees you controlling a bike that turns into a car and then a plane depending how many letters you collect. 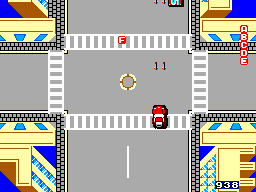 You start out controlling the motorbike from Hang On, so as a big fan of racing games the first thing i did was floor it!!! Pretty much straight away i realised that was a bad idea. I gently nudged the side of another motorbike and BBOOOOMMMM, straight into the curb. The collision detection on this game is pretty bad, you don't actually have to touch another vehicle to be sent flying off in another direction, and once that happens you have no control whatsoever. At first i was frustrated by this and as i hadn't read the instructions i was wondering how many lives i had left. Turns out i had unlimited lives until the timer ran out, which is a pretty novel idea. At first i thought "Great i can crash as many times as i like" but i quickly realised to get anywhere in the game crashing was a bad idea, every time you crash you end up with the bog standard weapon again. 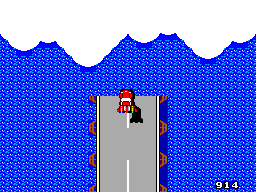 This isn't too much of a problem on the ground, there's normally plenty of SEGA trucks coming along which you can drive into the back of for an upgrade (or crash into and die like me), but when you're in the air it takes lots of precise bombing and shooting to force a power up to appear. Once you get into the game you quickly realise that all the enemies stick to the same attack pattern on the flying levels, the further you get the more they shoot but other than that it's the same. It makes the flying levels feel really repetitive, which is a pity because other than that it's not a bad little shooter if you can overlook the glitches. 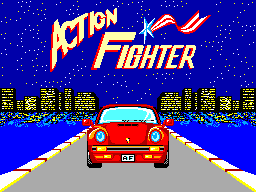 Overall i thought the graphics were pretty good, nice and bright, decent sized sprites, decent background. The only real gripe i have with the graphics are the clouds on the flying sections. Enemies and more importantly enemies projectiles just disappear under the clouds, only to reappear right next to you giving you no time to move. Some of the bosses are pretty badly designed too, the second level bosses look more like rubik's cubes than giant attack tanks, but hey who cares you're only gonna blow the damn thing's up anyway. Initially i liked the music, but after three weeks of play i'm suitably sick of hearing it. It's not really the tune that bugs me, it's quite catchy, it's more the high pitched level it's played at. The sound effects aren't too bad, when you shoot it sounds vaguely like you're firing some sort of weapon, helicopters sound like helicopters, but the accelerating car doesn't sound like a car at all. Put your foot down and it just bleeps faster and higher pitched. Add this to the high-pitched background music and you soon get sick of it. I actually turned the TV down when playing late at night to stop any passing bats that were attracted by the high pitched squeaking flying into my window. Now and again when you've dispatched an enemy (mainly choppers) the sound effect for that enemy will keep playing for a while too, very off putting as you're constantly wondering if there's a helicopter hiding somewhere in the clouds. The controls are easy to pick up and you get used to them very quickly. The only major gripe i have with them is you just can't shoot fast enough. If you're stuck with the bog standard pea shooter weapon it seems to take forever to destroy some of the enemies, especially the homing missiles. Maybe it's about time i invested in a Rapid Fire Unit. Overall it's quite a good shmup, not one of my favourites but very playable if you can look past the glitches. I'll definitely play it again, as infuriated as i get with the game i really want to complete it. If you've got a lot of patience then give it a go.